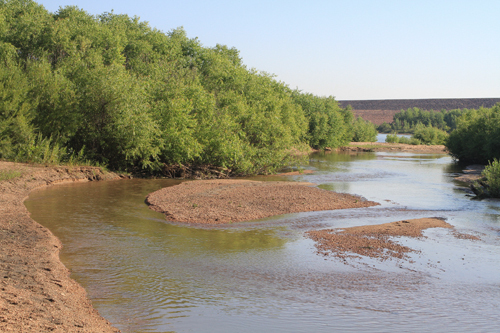 Plum Creek area in Chatfield State Park, showing much of the forest and riparian habitat that would be inundated at high water levels if the Reallocation Project is pursued (DEIS, Appendix M page 3-19). Note that north is toward the right on this map. The current mouth of Plum creek is off the north (right) side of the map. 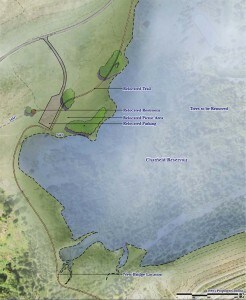 The parking lot near the picnic area is shown as submerged in the upper right corner of the map. Please click map to view a larger image. 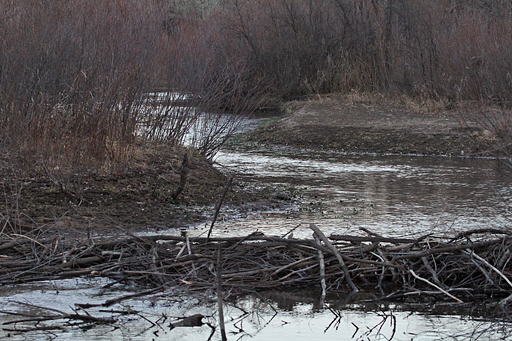 This beaver dam is a short distance upstream from the mouth of Plum Creek. The beaver would likely leave the Reallocation floodplain due to the lack of nearby food and dam-building resources. In recent winters, a small elk herd has been sheltered from sight by the bushes and trees of the Plum Creek riparian area during the day. As evening approaches, the elk move cautiously into the nearby fields. It is unclear whether there will be adequate daytime hiding places for elk within Chatfield State Park if the Reallocation occurs. 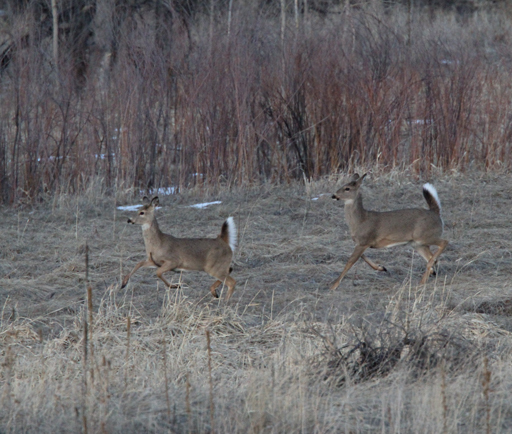 All year white-tailed and mule deer share the shelter of the Plum Creek riparian area during the day and move to more open areas to browse during the evening. 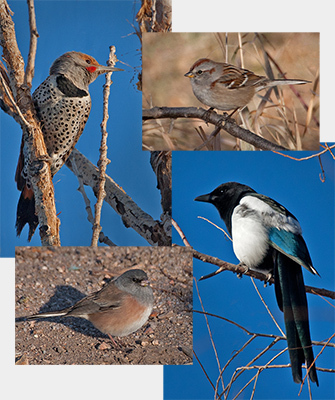 These birds, a Northern Flicker, an American Tree Sparrow, a Black-billed Magpie, and a Dark-eyed Junco, were photographed during the winter in the area near Plum Creek where habitat would be destroyed by the Chatfield Reallocation Project. 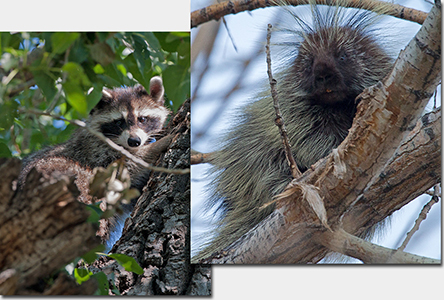 This Northern Raccoon and Porcupine are climbing in trees near the Plum Creek Picnic Area. Both trees would be cut down by the Chatfield Reallocation Project.